Hello everyone and welcome back to my blog! Today’s post is my plan with me for this week, November 6th-12th. This is going to be a really fun week and it’s leading up to my favorite week of all time, my birthday week! 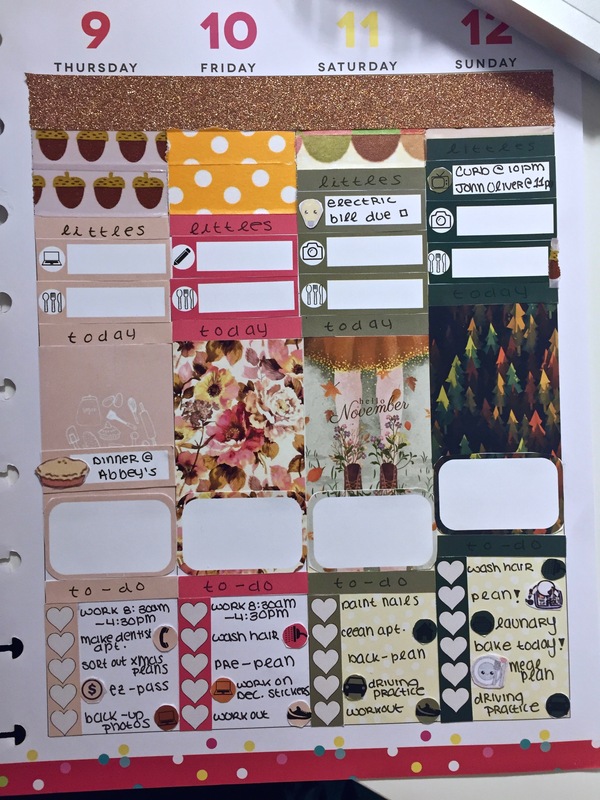 I use a Happy Planner and create my own stickers on Apple Pages using images found on Pinterest. 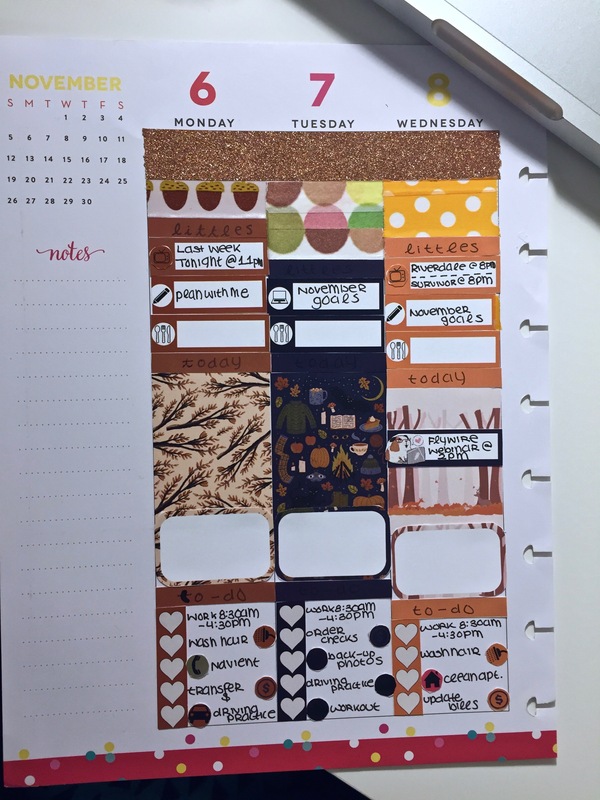 Check out my planner spread for this week below! Monday seems a bit busy this week, when I started planning last night my TV app was telling me that Last Week Tonight with John Oliver was on Mondays now, but it updated halfway through planning back to Sundays, so that’s why it’s in my Monday section. My to-do list has five tasks: my work schedule, washing my hair, calling my student loans lender, transferring money between my bank accounts, and practicing driving. I also think we’re going to do trivia that day, but if we do I’ll include it in the memory keeping portion of my planner. Tuesday is slightly less busy, once again having my work schedule, ordering checks, and backing up my photos. I also want to do some more driving practice and workout. Otherwise it’s a pretty calm day with no big plans. Wednesday picks up again with two TV shows I’m watching, Riverdale (which I just binged and LOVED) and Survivor. I also have a webinar for work that I wanted to keep track of, so that’s in my today section. In terms of to-do’s it’s relatively small, with just my work schedule again, washing my hair, cleaning my apartment, and updating all the auto-pay bills. Thursday we will be having dinner at a friend’s house, so I put that in my today section as a reminder. For to-do’s, I have work, making dentist appointments for myself and my boyfriend, and figuring out our definitive Christmas plans for this year. I also need to check our EZ Pass and finish backing up the photos on my computer. Friday is back to normal going-ons for the most part, I finish off my work week, wash my hair, and pre-plan for next week (my birthday!). I also need to work on my Christmas stickers and workout at the gym. Saturday’s to-do’s are all the normal weekend things, such as painting my nails and cleaning my apartment. I also need to make sure to back plan for this week for memory keeping, as well as have some more driving practice and workout again. Sunday has some more plans, my Mom and Grandmother are planning on visiting but since I don’t know specifically what we’re doing, I’m just going to include that in the memory keeping portion. My to-do section includes: washing my hair, planning, and doing laundry. I also need to bake a pie to bring into work (more on that next week), as well as meal plan and finish out my driving practice for the week. I really love how my sidebar came out this week, it’s all basically stickers from Paper & Glam but it looks really fun and fall festive. The decorative box is from last year’s November kit, and then I have a top three box for my weekly goals, which are getting my blog posts out on time, calling my student loan lender, and actually practice driving. Then I used three functional decorations to track weekly reading, working out, and blog stats. I also added a Happy Planner sticker box to make a huge cleaning list, as well as adding a daily habit tracker for washing my face. So there we have it, my plan with me for this week. I’ve been struggling lately to plan and get back into the swing of things, but I love how this spread turned out and I’m hoping this will get me back on track. 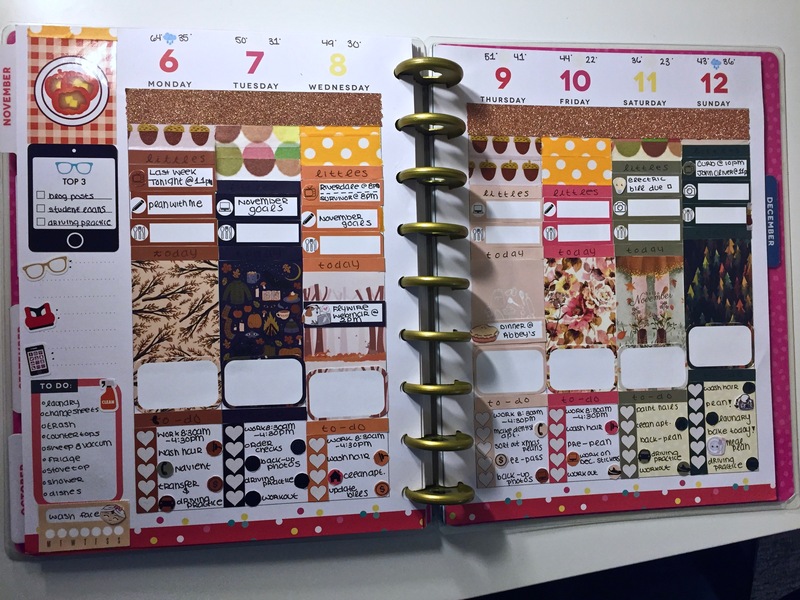 What spread did you use in your planner this week? Let me know in the comments below! See you next time!